Petzl Connect Adjust. Single positioning lanyard with adjustable arm. 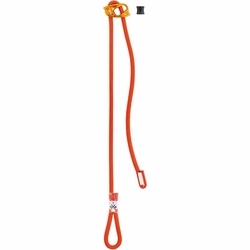 The CONNECT ADJUST lanyard is a single positioning lanyard with adjustable arm, designed for sport climbing. The ADJUST rope adjuster's ergonomic shape offers simple, quick adjustment. The CONNECT ADJUST lanyard is suitable for any situation encountered in sport climbing and mountaineering.